Our Power BI Consultancy team is pleased to announce the launch of a new Power BI Services Website. Thousands of clients, small and large, have transformed their businesses with Influential Software’s BI services over the past 20 years. At the same time, we understand that business intelligence offerings are rapidly evolving, and work to ensure our clients stay ahead of the competition. Power BI is an agile BI tool that provides SaaS insights for both growing business and enterprise teams. To ensure our clients get the very best ROI from Power BI, we provide consultancy and support services to ensure your teams and your business get the best out of the amazing Power BI toolset. Are you ready to optimise your business? Find out how to leverage the ever-growing volumes of data that are crucial to keeping your market edge. 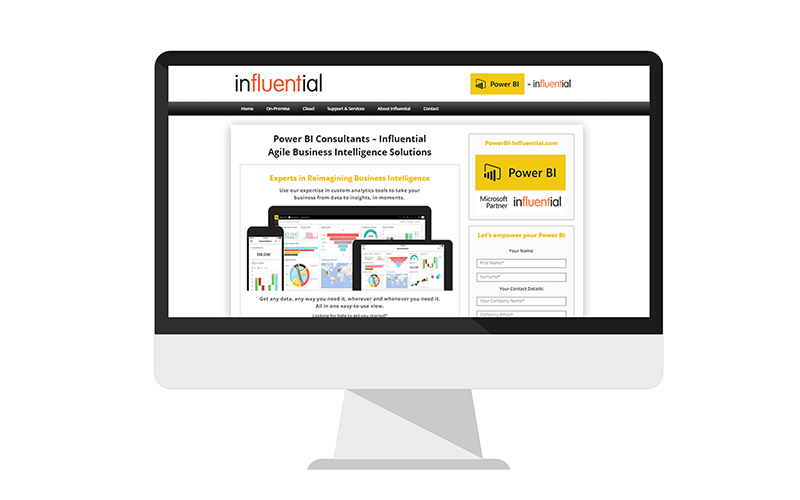 Influential Software’s Power BI support and consultancy services are based on years of experience, and thousands of successful BI implementations. Our priority is maximising your system’s suitability to your business processes, resulting in fewer man-hours and higher ROI. Power BI software is a SaaS-based online service, first released in 2015. Businesses can use Power BI Desktop to create powerful connections, models, and reports for sharing on Power BI. The service has persisted in the highly competitive BI market because of its flexibility and ability to work with a wide range of software. The Influential Software team is expertly qualified to design the optimum Power BI Services for you. One of the major benefits of Power BI is its wide connectivity. Businesses can consult us on the best use of Power BI with sources such as Excel, Azure, CSV, Web Pages, MySQL, Microsoft Dynamics CRM, Sharepoint Lists, Oracle, Salesforce, and MailChimp. While Power BI is primarily a cloud-based analytics service, on-premise options such as on-premise Power BI Report Server are available. Other on-premise solutions include the Data Management Gateway and Power BI Mobile Apps, meaning there is no one-size-fits-all solution. Connectivity with Azure cloud services such as Azure HDInsight, Azure Blob Storage, and Azure Table Storage make Power BI a powerful tool for refining data. Influential Software’s accredited trainers and skilled implementation specialists are primed to assess your needs and provide effective solutions. You can visit our Power BI services website to find out a little more about Power BI options. Or, if you are looking for more agnostic Business Intelligence consultancy, advice or solutions, why not ask have a chat with our Business Intelligence team to find out what options would best suit your business.